for Cloud Server SynQuacer™ S-Series | Socionext Inc.
SynQuacerTM S-Series is cloud server which is able to cluster up to 64 CPU of high efficient processor "SC2A11". Highly integrated low-power server system can be realized with SC2A11. SC2A11 is also suitable for edge computing which processes data at the edge of the cloud in the IoT era. 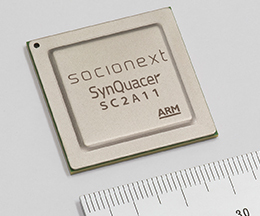 *:SynQuacer is a trademark of Socionext Inc.
High energy-efficiency processor element is realized with multi-core configuration of ARM Cortex-A53. Large amount of data can be processed faster in memory by adopting 64 bit architecture.